OLIVETTI SIGNATURE TOOLKIT (O.S.T.) is a powerful solution that secures the process of signing an electronic document by a Handwritten Biometric Signature, where the Document is required to have a legal force over time, and can be used in litigation. It is compliant to the to the Directive 1999/93 of the European Parlament about Electronic Advanced Signatures. It' very easy to integrate and has been deployed by many large cutomers such as Banks and Insurance Companies, where large volumes of documents need to be signed in very short time slots. OLIVETTI SIGNATURE TOOLKIT supports the main O.S. installed on the mobile tablets: Android, Windows e iOS. Olivetti strongly recommends to use a mobile tablet supporting a biometric digitizer, since the signature will then include the biometric data captured in the right way. A normal capacitive stylus does not provide the standard requirements, even if it is adopted to support BYOD (Bring Your Own Device) policies. 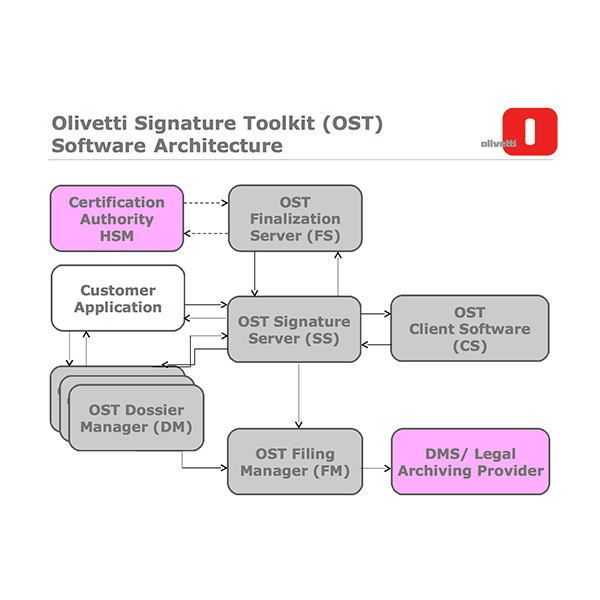 OLIVETTI SIGNATURE TOOLKIT is a multi-vendor platform, meaning that is able to support signature pads manufactured by specific device vendors. The solution supports the traditional 5" signature pad, able to capture a signature, as well as the more innovative either 7" or 10" tablet that enable to display the full document and allow the signatory to review documents before signing. OST takes care of the document to be signed once it has been created by the customer's app. The operatore push an icon on his desktop and the document is switched from the desktop, at the operator's side, to the signature pad at the signatory's side. Now only the signatory is enabled to control the document. In the meantime the operator can freely get on with different tasks. The two operational environments are fully independent (double mouse feature). Once the signatory has reviewed the document and given all the mandatory signatures, the document is automatically finalized and sent directly to the DMS and Legal Archiving. A hard copy can be printed and given to he customer, as well as sent by email or published on a personal portal. With much experience gained in delivering solutions for customers Olivetti has launched its own set of Signature Pads for capturing the biometric data at the desktop. In order to check the signature and the integrity of the document, no Olivetti tool is needed, but just a standard PDF viewer. 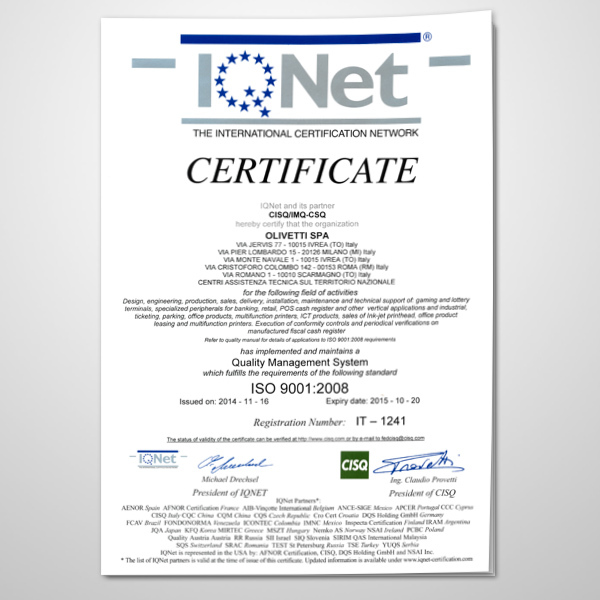 Olivetti is certificated ISO 9001:2008. 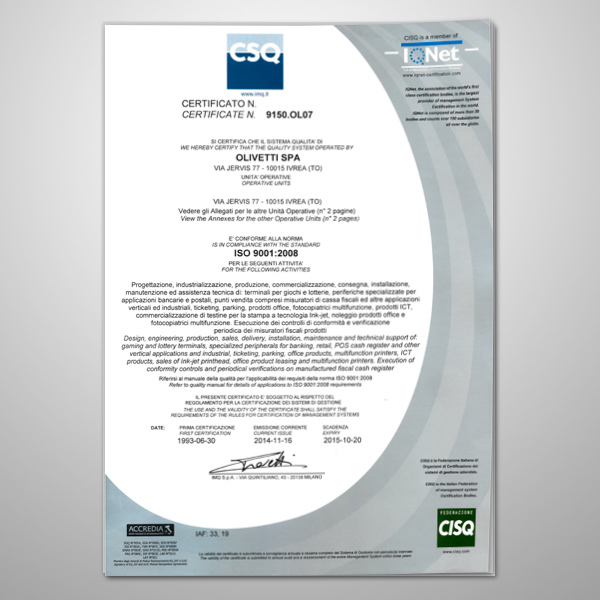 Olivetti is also certified ISO 27001:2013 for "Design and implementation of I.T. solutions including advanced electronic signature, qualified and digital signatures, all of them also based on biometric systems". Three different options are available to implement a solution involving Olivetti Signature Toolkit. CLIENT / CLIENT-SERVER: A local app (OST CLIENT) is installed on the Laptop/Mobile Tablet. The document to be signed can be created by a local app and sent directly to OST CLIENT. Depending on the type of process implemented, the document can be syncronized with a Server software module (OST SIGNATURE SERVER) that seal it (interfacing a Certication Authority or an HSM) with a Qualified Certificate and is finally sent, with configurable policies, to the Legal Archiving environment. SERVER: A different option is to work directly on the server, using a web browser. In this case the document that is been processed is hosted on the server and not locally. All the process features described for the CLIENT-SEVER option are provided as well. SDK: OST can directly be integrated in the customer's app by using the SDK tool. Off line - On line: Using either CLIENT or SDK option, the document can be signed even if the connection is temporarily not available (very important feature when the solution is running in mobility). The software architecture of OST is based on a server module and a client, installed either on a PC/Laptop (Windows 7), a Mobile Tablet (Android, W8 and IOS ). Additional (server side) software modules take care of handling the interface with DMS and Legal Archiving solutions, as well as interfacing, if needed, to a local authorized Certification Provider. 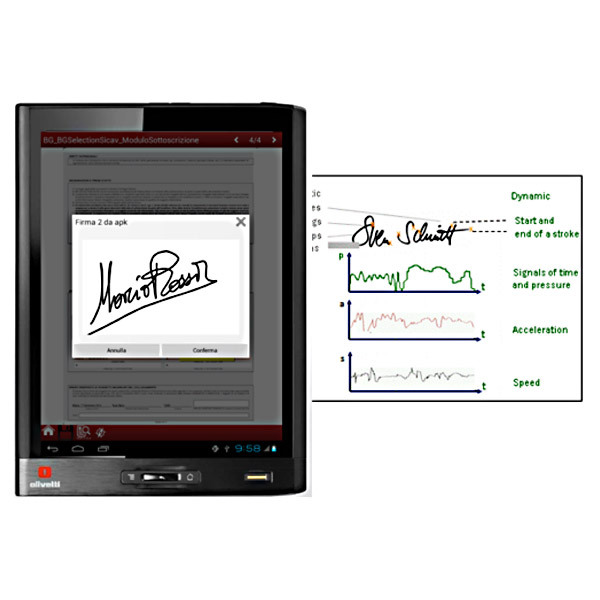 Olivetti has implemented Handwritten Biometric Signature projects in different industries. Olivetti has implemented solutions for digitization of front office operator activities, as well as digitization of contracts at the consulting desks. These solutions are based either on a fixed (as a Bank Teller ) or on a mobile scenario, ( as in Financial Advisor scenario). For Technical Operations: Technical notes, test results, delivery statements, etc.